When you hear about a student who gets straight A’s, is heavily involved on campus, and wins awards, you may think that person has only a few challenges in their life. Think again. 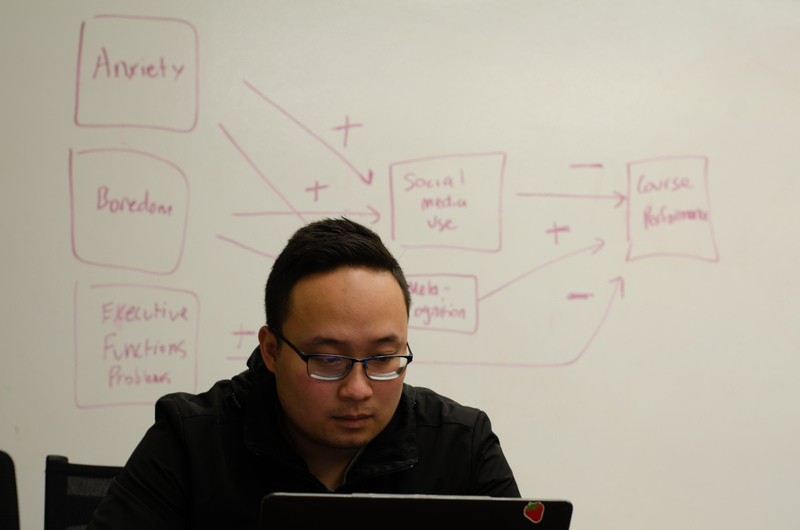 Sure, at last month’s Student Research Day, senior Andrew Luu, 24, a psychology major and business minor in data analytics, took home three awards with projects delving into digital metacognition, Generation Z college performance, and the future of robotics and human employment. But though he’s highly motivated, seems to have found his calling in academic research, has his sights firmly set on graduate school, it’s taken a great deal of work. Luu is a first-generation student and a former chemical engineer major at UC Riverside who never felt passionate about the career his parents wanted him to pursue. He struggled at UCR, choosing to leave and enroll at El Camino College where he discovered psychology. He then switched his major to psychology after transferring to CSUDH two years ago where he was introduced to the world of research. He spends most of his time researching in the psychology department’s George Marsh Applied Cognition Laboratory, which mentors promising graduate and undergraduate students. In addition, he is the vice president of CSUDH’s chapter of Psi Chi, an international psychology honor society, a member of the InterVarsity Christian Fellowship, works as a supplemental instructor tutoring freshman statistics and is determined to get his doctorate to become a professor and researcher. His secret? No sleep, a ton of coffee, and a flexible schedule. One thing that was not on Luu’s schedule was leaving UCR. His parents, who are from Vietnam and did not get past grade school, were shocked and disappointed. Though he had plans to re-apply to UCR after enrolling in El Camino College, once he discovered psychology, he decided to pursue it at CSUDH. His natural inquisitiveness caught the attention of a classmate, who asked him to join the GMAC Lab and get involved with research. At first, he knew little about research but after seeing how devoted and involved professors were in their research, he said it was like being introduced to a whole new world, one where science wasn’t just lab coats and chemicals. He said he realized psychology was a science as well, but that its concepts and constructs are just harder to measure. Getting involved with research also opened up the possibility to go to graduate school. But now that Luu has decided to pursue graduate school, he faces his biggest hardship: money. He pays for materials, flights, registrations to conferences and grad school applications. He recently paid $400 to register for a conference, not including his plane ticket and hotel stay. He applied to 10 different grad schools with fees ranging from $60 to $100. Luu’s parents sometimes help him, but he has two younger brothers, so he said he pays for mostly everything on his own. He applied to the McNair Scholars Program, which covers all expenses for students who want to go to graduate school, but because he had dropped out of UCR, he wasn’t accepted. He applied again after his first SRD wins last year, but he no longer qualified because McNair wants to work with students that have two years left. Luu graduates this May. Despite the stress of money and applying to graduate school, Luu said he has developed a “let it go” philosophy because he knows, in the end, it’ll be all be worth it.